Great Escape Classic Car Hire's 1965 British Racing Green Jaguar Mk2 saloon will feature on John Bishop's Britain, scheduled to air on 6th August 2011. The car features in a comedy sketch written by the comedian to appear in his popular Saturday night BBC1 television show. We worked with the production team to provide the Jaguar at very short notice. We had to rework our vehicle logistics schedule in order to accommodate the request, fortunately without letting any customers down. Great Escape Classic Car Hire regularly provides classic cars for television and film companies as well as advertising agencies. Our cars have appeared at The Brits and various films and documentaries for the BBC and Sky as well as numerous magazine and advertising shoots. We have full trailer and truck facilities for simple, reliable delivery and collection and can provide staff during the shoot to prepare and manouvre the vehicles. The Jaguar Mk2 is for hire in the Cotswolds. 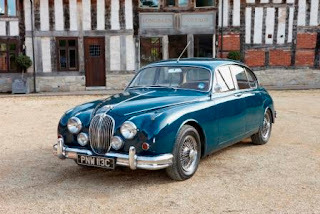 It is one of three Jaguar Mk2 cars on the Great Escape Classic Car hire fleet. The company has a range of 50 classic cars for hire from 6 UK locations. For more details visit http://www.greatescapecars.co.uk/ or call 01527 893733.